After over a hundred years build-up of dust, dirt and strands of Emily’s hair, the Brontë family piano is finally going to be restored to full working order. The only problem we have now is - who’s going to play it? Up until now, the cabinet piano, presented to the museum in 1916, has been displayed and admired as a piece of authentic Brontë furniture but with the help of private funding, we are now able to restore the inside mechanism so that it can be appreciated by all as a musical instrument. The piano was mainly used by Emily, although Branwell and Anne would have also used it to a lesser extent. Ellen Nussey once described Emily playing ‘with precision and brilliancy’ and by the time Emily went to Brussels in 1842, her playing was of such a high standard that she was taught by one of the best music professors in Belgium. 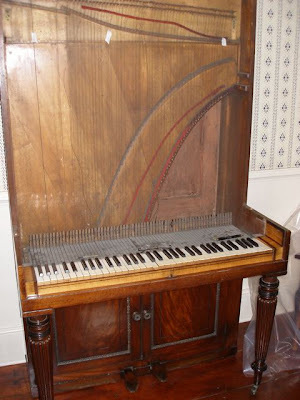 The piano was probably made in London between 1810 and 1815. It bears the inscription John Green, music agent of 33 Soho Square, London. 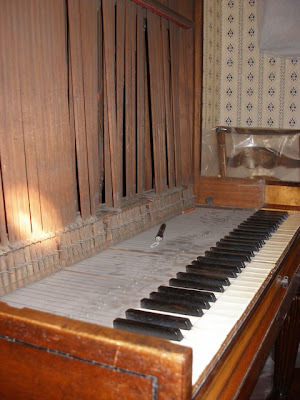 It has a fairly short five octave keyboard of ivory keys which will be kept intact, and the broken hammers and strings which are hidden behind a screen of maroon-coloured pleated silk will be replaced so that the piano will play for the first time in over one hundred years. 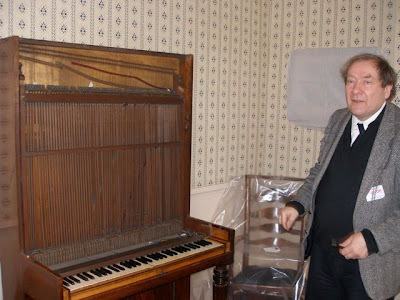 Piano restorer Ken Forrest (pictured below) has examined the piano and informed us that there are parts missing which will need to be replaced and it will need to be completely restrung. 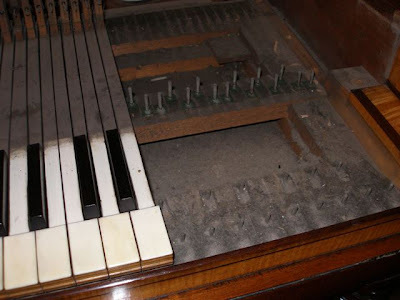 He also said that the ivory keys are going to be kept but are in need of some renovation. He is going to be researching similar pianos in order to gather together more information before restoration can take place. Cabinet pianos were popular in the 1830s and 1840s but today are rather unusual when compared to the more valuable pianos such as the Grand. Our cabinet piano is one of many items that were auctioned off in the 1861 sale of Brontë objects. It was bought by a Mr Booth of Oxenhope and sold many times before it was donated to the Brontë Parsonage Museum in 1916. If you are in the UK, you might like to note that the Richard Cavanagh - Orla Brady version of Wuthering Heights is to being shown on ITV3 this Sunday 3 February from 15.20 to 17.45. Orla Brady is now an almost unbelievable 46 years old (see the photo below and the previous post) and is apparently the 'lady in red' in The Singing Butler - the ubiquitous Jack Vettriano watercolour in which two lovers are dancing on a windswept beach. The self-taught Vettriano used The Illustrator's Figure Reference Manual as a starter, he revealed when the original painting went for three quarters of a million pounds in 2004. The hacks then started digging and found that Orla was one of the models in the guide, and his muse. Find more in this article from You magazine. Having now watched my fifth version of Wuthering Heights (the 1978 Hutchison/Adshead version), I set to wondering why none of the actresses who played Catherine (the elder) quite worked for me. The answer came to me as I looked at the timeline of the novel and I think it boils down to their ages. In the book, Catherine is 15 when Heathcliff runs away and just 18 when she dies. Even the youngest of the actresses is five years older and the oldest is 19! (although, admittedly, Orla Brady looked much younger). However, each of the actresses appears clearly adult, not the teenager than Catherine was. We should also remember that an 18 year old was not the adult they are considered today: people did not come of age until 21. If you think of Catherine as a slightly immature teenager rather than an adult, it brings a whole new aspect to the story. Her spitefulness towards Isabella, the "dashing her head against the arm of the sofa", her attempts to make herself ill: these become more believable if we imagine a younger teenager performing them. There is also a deeper pathos to the scene in chapter 12 where Catherine in her delirium wishes she were back in Wuthering Heights. If we think of her as a child then rather than a spoilt adult, we can have more sympathy for her. We could feel the loneliness and sadness of a child forced into an adult's world. It would be fascinating to see a version of Wuthering Heights with Catherine played by a teenage actress (or one who could pass as teenage). It would be rather like seeing Juliet of Romeo and Juliet played as the 13 year old she was supposed to be. It would need an actress of great skill and subtlety, of course, able to switch from mature love to childish petulance, but what a role. And what a new interest it would add to the scenes with Heathcliff. One of the largest movies ever to be filmed in Yorkshire is in danger of leaving the region, warns leading Yorkshire movie producer, Film Squared based in Sheffield. The company is offering local businesses the opportunity to help bridge a gap in the financing of its latest project Brontë which is being represented by Mel Gibson’s Icon Entertainment at next month’s Berlin Film Festival and is due to start filming this spring. The film about the lives of Yorkshire’s most famous writing family and starring a raft of UK and US talent is short of just £350,000 after a backer withdrew because of the current problems with the international money markets. “As a result of the funding problem, we may be forced to relocate the filming to another more cost-effective location, but we desperately want to keep the film in Yorkshire,” explained Producer Alistair Maclean-Clark. The £5million movie is a joint project for Film Squared and Pinewood Studios-based AMC Pictures - and unlike many UK films, Brontë has already secured distribution and global representation through Mel Gibson’s Icon Entertainment. Film Squared’s Nick Wild believes that the Yorkshire business community will rally round, “We have already had great support from some passionate local private investors and financial professionals and are now looking to extend that opportunity. With global cinema and DVD distribution the project offers great possibilities for local brands to be involved with this high profile project and spread their brand around the world. We are working with many of the local agencies and have a whole raft of opportunities to be involved from high-level corporate sponsorship to tax efficient investment regimes for private investors. For more information, please visit the movie's web site (see links) or contact Nick Wild at Film Squared on . Classical comics has been in touch with the Parsonage Blog to inform us that their new version of Wuthering Heights will be coming out in 2009. More details nearer the launch, no doubt. I’ve just finished watching the 1978 BBC dramatization of Wuthering Heights on two DVDs which I bought last summer in the Parsonage shop and now I really consider it to be the best among the various screen adaptations of Emily Brontë’s novel ever realized. Of course I knew that BBC dramatizations are always of the finest level (Pride &Prejudice, North and South etc.) but I was amazed in finding this almost unheard of adaptation so adherent to my beloved novel and above all, so careful and attentive to those particulars often ignored by other directors, with only a few differences from the original text. No wonder that the BBC never attempted to adapt Wuthering Heights again. 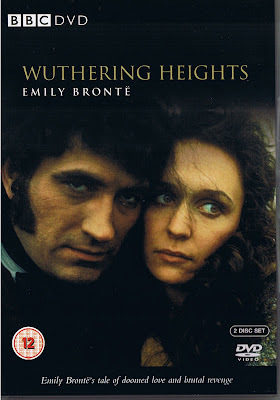 Thanks to its running time of 255 minutes and its five episodes, the mini-series Wuthering Heights (directed by Peter Hammond and starring Ken Hutchinson and Kay Adshead, originally transmitted in the UK from September to October 1978) boasts many strong points, from the particularly vivid atmosphere of the moors conveyed from the beginning to the very last scene and the authentic use of Emily’s own language and phrases. 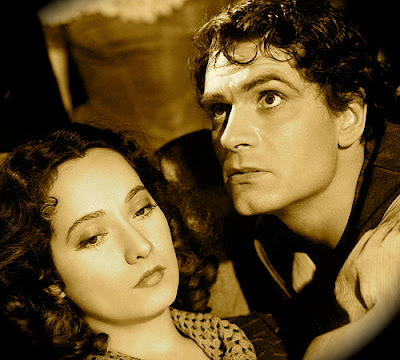 Cathy and Heathcliff’s affection for each other is rendered through the intensity of their looks and not by words while the recurrent close-ups underline the force of passion in a most effective way. Also the minor characters are well-drawn, each in his or her own peculiarity, although we find a ‘milder’ Joseph and a pleasantly strong Isabella with a will of her own, which departs from any other known adaptation of the novel. For once we have no narrator of the story and Nelly Dean appears only in her role of a servant, not always or entirely convinced that her master's actions are right. Notably the burning fire in the enormous fireplace at the Heights is put into the limelight just when the main characters’ souls are torn by agony and their inner cold. On the other hand, there are obviously a few weak points, mainly the missing snow substituted by a frequently driving rain on the moors always announcing fatal events or, in episode two, a too long childhood against a too short teen period for Cathy and Heathcliff. This last character appears as an old man even when he is still young, almost as a hunchback with a displeasing voice, but Ken Hutchinson’s interpretation of him in the last stages of the character’s life is superlative. The image of dying Heathcliff is not easily to forget. A regrettably missing moment in so attentive an adaptation is the beautiful passage in the book in which while lying in the moor the second Cathy and feeble young Linton speak of what they like more in life. What else is to be said? All Brontë lovers can only enthusiastically welcome this blessed reproposed offer by the BBC after so many years of oblivion. It is now twelve months since the launch of our purchase fund appeal. In that time £50,000 has been spent on acquiring a dozen new items for the collection, with £10,000 of this having been generously donated by members of the Brontë Society. Because we have been able to show this level of support from our membership, we have been able to get grant aid to support these purchases from the National Art collection Fund and the V&A/MLA purchase fund adding up to over £8000. It is important that we continue to add to the collections and ‘bring home’ Brontë items to Haworth. Eighteen months after the foundation of the Brontë Society, sufficient material had already been collected to merit the opening of the Society’s first museum in 1895, and the collections have continued to grow steadily ever since. The collections are used as an important resource by scholars from around the world, in our education work and to bring alive the Brontë story for the thousands of visitors who come to the Parsonage each year. I am now widening the appeal directly to the readers of the Brontë Parsonage Blog, many of whom might not be Brontë Society members. You are invited to send us donations to help us compete in the sale rooms and ensure that we all have the opportunity to create a direct link to the Brontës through their belongings. All donations are welcome either as one-off donations (in any currency) or regular monthly payments. It is important we receive regular donations to the purchase fund as the items we are interested in acquiring are usually to be sold at auction – and it is not always possible to make appeals for specific objects beforehand. In March 2007, Stevie Davies, Patricia Duncker and Michele Roberts gathered around Patsy Stoneman at Haworth in Yorkshire to talk about the influence that the Brontës had had on their evolutions as authors, and more generally, about the source of inspiration that the most famous family of writers in England could represent. Patsy Stoneman had already tackled the topic by publishing a book entitled The Brontë Influence in 2004 with the help of Charmian Knight. The issue of LISA e-journal « Re-Writing Jane Eyre: Jane Eyre, Past and Present » is further evidence of Charlotte Brontë’s influence on the writers of the following decades or centuries. So far, these studies have been quite limited and this field of research, “the Brontë influence”, offers a wide range of possible developments. Moreover, if the four authors’ poetry and novels have already been the object of numerous studies, there is much left to write about the influences which were exerted on the Brontës, whether religious, literary, philosophical or cultural. Taking account of the context of a work is often a good way of understanding the issues underlying a text: the path taken by the Brontës, their journeys, their stays abroad, the books they read, etc. could prove to be very enlightening. Besides these external factors, one could also consider the interactions between the three sisters, who wrote in the same room and who read passages from their works aloud. A final aspect to identify and study could be the influences which are exerted within the Brontës’ works themselves. How can one account for the progress of the heroes and heroines? How is the influence that characters have on one another expressed? What role does nature play in the destiny of characters? Which other elements intervene in the novels? - the Brontë influence on the writers of the 19th, 20th and 21st centuries. Patrick Brontë considered that his daughter Charlotte was not strong enough for marriage, and he sems to have been right at the time, before doctors and hospitals were able to cope properly with hyperemesis gravidarum, a kind of extreme version of morning sickness. This was probably what took her away on 31 March 1855. The catch-all 'phthisis' was written on her death certificate. This is morning, afternoon, evening and night-time sickness and it blights somewhere around three in a thousand pregnancies. At its worst, the sufferer is unable to keep down so much as a sip of water, leading to severe dehydration and malnutrition. This is so debilitating that reading, watching TV or facing daylight may become unbearable. If you've ever been hit by a bad oyster you can possibly sympathise, but imagine such food poisoning lasting not for a day or two but for 8, 16, even 36 weeks. In the days before IV drips, the condition was fatal for the likes of Charlotte Bronte, but now patients are mostly kept alive with regular inpatient stays and the magic of a saline bag. The Dance COLEctive (TDC), under the direction of award-winning choreographer and teacher Margi Cole, will perform a revised work, a premiere and two revivals for its Second Journeys Winter Concert Series February 21–23, 2008 at The Dance Center of Columbia College Chicago, 1306 S. Michigan Ave. The program features a reconstruction of Artistic Director Margi Cole’s Written on the Body, plus works by choreographers Colleen Halloran, Jennifer Kayle and Ellie Klopp. TDC also will participate in The Dance Center’s FamilyDance Matinee Series, presenting an hour-long performance geared toward families preceded by a movement workshop free to ticket holders on Saturday, February 23. Written on the Body uses the lives of the Brontë sisters as a point of departure in its exploration of gender roles and stereotypes. The hidden identities of authors Charlotte, Emily and Anne Brontë, as well as the hardships they endured throughout their lives in Victorian England, provide the framework. Cole interprets the Brontës’ masculine and feminine personas, using images of power, strength, vulnerability and intimacy, exploring how each attribute can be related through movement. Music for the piece is by Kevin O’Donnell, costumes are by Atalee Judy and videoscape is by Michael Cole. Chicago choreographer Colleen Halloran is creating a new work, tentatively titled It Is Okay To Leave. Working with five dancers, including guest artist Dardi McGinley Gallivan, the piece takes place in an atmosphere of suspended reality and explores issues of departure, observation and time. Sound design for the work is being created by Susan Aldous. Also on the program are two revivals. Channel is a commissioned solo for Margi Cole by Ellie Klopp, former associate director of Margaret Jenkins Dance Company, with music by Alvin Curran. Jennifer Kayle’s award-winning at the receding edges is a moving meditation on the human and spiritual connection to the body of the earth and on the dangers of disconnection. Set on four squares of plastic grass, images of community, scarcity and disintegration appear and disappear in this poetic landscape.